Studex Tiny Tips 3mm crystals set in hypoallergenic 24 carat gold plated surgical steel tiffany stud earrings with matching butterfly backs. 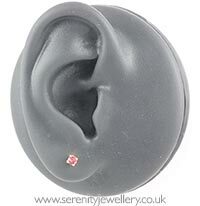 These earrings are a lovely colour red nice and bright and sparkle in the light. I've bought quite a few of these earrings now for my daughter. Perfect for anyone with sensitive ears. I love small dainty earrings & these definitely don't disappoint. They are great for sensitive ears. I love the blue sapphire stone too. love all earring thay are so shiny, delicate. thank you very much for your amazing service. 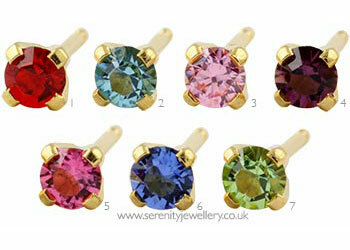 I think these are marketed for children, however as an adult these are lovely, small, smart stud earrings. I purchased aquamarine and will look to get other colours in future. It's just the packaging that's designed to appeal to children. 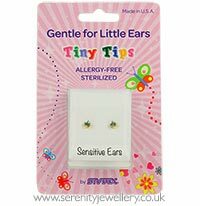 The earrings work just as well for adults (the post sizes are exactly the same as the Studex Sensitive range), especially if you like smaller sizes. Beautiful delicate colour stone, quality claw setting. Will be purchasing more colours!